Dan thrust his arm into the dark depths of the engine. This beast of a vehicle which is a Portuguese military jeep seems to be a cross between a Humvee and a Land Rover and was being a little temperamental and didn’t want to start. 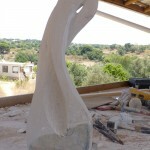 I’d just arrived in Portugal to risk my life harvesting honey from Dan’s bees and to make a stone sculpture of my own devise for the first time. Right now, we’d just finished off the evening with some delicious Piri Piri chicken at an understated restaurant owned by the charming Senior Aurelious. So much so that he gave us some complimentary Madronia which is akin to Vodka to clean the pallet and help wash down the dried figs that we had as a dessert. I myself had got so engrossed with the delight of the Piri Piri chicken that I pretty much polished off the shared plate before Dan even got a piece. I didn’t realise that Dan is one of those people that saves the best until last on his plate, I on the other hand am a little less indiscriminate and have a veil of ignorance when it comes to sharing etiquette and food. If you put food in front of me, beware. Dan had warned me about the jeep not starting and keeps a screw driver in it at all times just in case. It was by this stage dark and Dan could see nothing as he took the screw driver and thrusted it into the engine. As his arm disappeared sparks erupted from the dark depths and then a roar erupted as the engine miraculously sprang into life. The beast was alive and it didn’t bite Dan’s arm off. Hopefully his bees would be so tame. The next day I awoke with trepidation as I knew that we were going to harvest the honey, which is much more like stealing if you ask me. 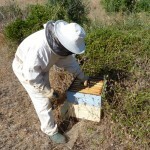 I feel the bees think the same way as going down to the hives is like preparing for battle. You don a full white suit that is totally sealed so that the beed can’t get in. I could see that Dan was a little nervous. You don’t want to be forgetting the smoke machine or your protective gloves for instance. Dan was fondling the two hats and trying to decide which to give me. “I will take the square one.” Why even ask? 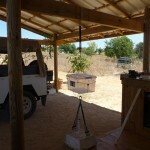 We drove down to the hives in the faithful jeep and jumped out like commandos, I thought about doing a forward roll but the Portuguese plants are very prickly and I thought better of it. There in front of us were two blue boxes that at first sight looked quite friendly. But I could see by Dan’s mood that this was not so and I was not to underestimate the swarm within. Where is the smoke gun? Was my suit as impenetrable as I thought? Earlier, I had been so paranoid about my armour that I had found a small hole in my shoe that looked very much bee size. I had made Dan tape it up. I was also wearing a jacket under the suit just in case the bees tried to punch through the fabric of the protective cloth. There is no point taking any unnecessary risks even though I was sweating to death. Portugal is hot. 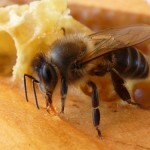 But the thought of bees sticking me with their little stings was even more overwhelming, the last time I was stung by a bee was when I was five years old as I attempted to close my hand around one. It is the most painful experience in my memory . With little ceremony Dan lifted the lid off the first hive and was immediately concerned as there was no swarm attacking us. Nevertheless, always the one to never disregard personal safety I suggested using the smoke machine to chill them out a little. “Oh, yeagh. Good idea” concurred Dan. 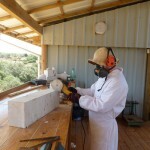 We took the hives up to the studio and rested them upon the desk. 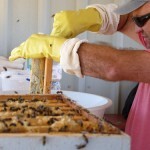 A handful of bees had followed and were trundling about the place lapping up all the honey. Apparently, it now became the bees objective to collect all the stolen honey and take it back to the hive. To extract the honey, Dan had devised a centrifugal box that spins the frames so that they honey flies out of the box and collects the honey in the bottom. This was an arrangement of bunji chords, string wire and a plastic box, very high tech. So much so that after we had erected it we had to go and have a break and lie down after our morning ordeal. 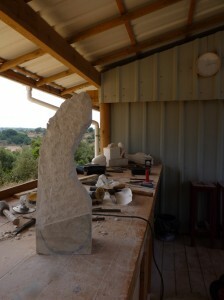 It is a wonder that the Portuguese can get any work done at all in this stifling heat. Perhaps this explains their current economic crisis. 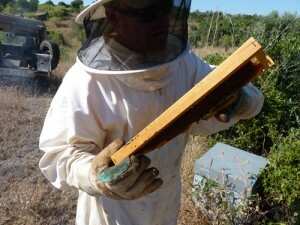 After our siesta and now fuelled by a turbo coffee kick we were all charged up and ready to extract the honey. Unfortunately, the bees had exactly the same idea and as we approached thousands of them had found the honey and were busy lapping it up to take back to the main hive or to steal it to neighbouring hives. 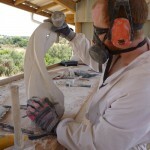 I of coursed donned my suit, zipping myself up and fixing on my hat and gloves. Mr Invincible all in white. Dan on the other hand decided to protect himself only with his shorts and pink t-shirt. Thousand of bees I say again. 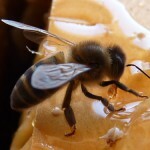 “Awe, they’re not aggressive now, they’re just wanting to take back their honey. There’s no danger really.” I nodded my head in agreement in the safety of my Mr Invincible suit. Yeagh right Dan. Total disbelief then flushed over me as Dan wearing only gloves lifted one of the frames out of the hive covered in Bees. 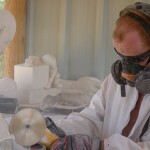 Gently, he took it over to the centrifuge plastic box and inserted it. It has to be said, that nothing is perfect. But our centrifuge box was much less than perfect. The spinning bit worked a treat, as the box spiralled around in a circle. 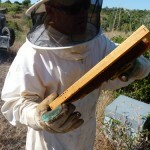 The honey started to extract from the combs under the G-Force as planned. However, as the plastic box spun out of control the force was so great that the honey rose up the sides of the box seemingly unhindered by the rubbish lid we had on top of it and proceeded to spray over us, the jeep, the motorbike, and the whole studio. We just needed some milk and we would have been in the Promised Land. Not to be deterred Danny Boy slowed down the spin and that kind of worked to a degree but was tedious. I could see Dan loosing his patients and declaring that he was going to jack in all this bee keeping business but I have a feeling that nostalgia will get the better of him. 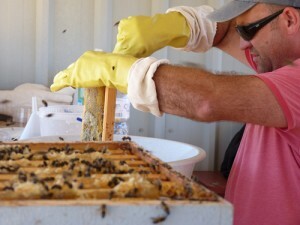 In the end we opted to just scrape the honey out wax and all and put it through a sieve. Brutal but affective. I am also pleased to report that during this business Dan did indeed get stung. Not because the bees were aggressive, he was right about that, but because they became trapped in the fabric of his gloves. His arm swelled up like Pop-Eye’s over and over the next three days he winded like a girl. Love it. 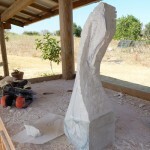 During the rest of my stay the main objective was to make a stone sculpture using all of Dan’s delightful tools. 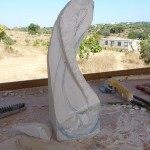 This will be one of the first stone sculptures that I will have made that is of my own design. 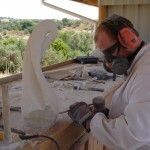 It’s a wonderful thing carving a sculpture only for the sake of the lines themselves. 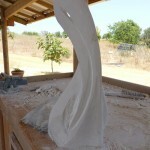 There is no mission or objective that is greater than the sculpture itself and the lines that it is. Your only guide is impulse. 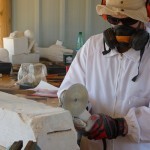 This is a very free and pure form of carving. 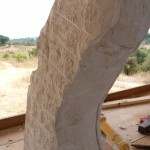 Of course, with stone, your impulse has to last a number of days as there is no quick remedy to success. 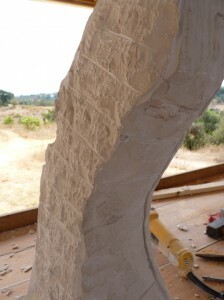 Stone is hard. This may seem like the most obvious thing in the world to say but it has to be said as stone doesn’t want to chip away so easily. 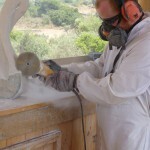 For four days I cut away with the diamond blade angle grinder and hand chisels, getting covered in dust and breathing through a mask so that I didn’t burn my lungs with the lime. 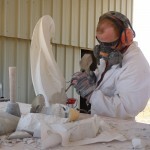 On the last day the studio was completely caked in dust. And after all that, I didn’t even finish. Nearly, but not quite. 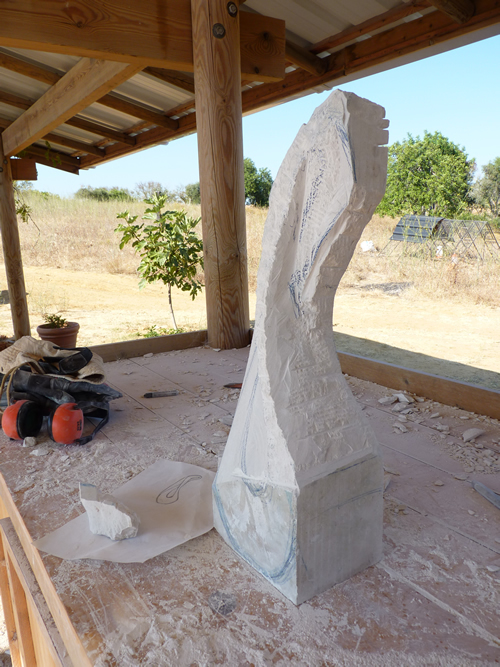 There is now a block of stone in a studio in Portugal that looks very much like something but is waiting for my return so that it can finally become. Eh up Patricia. 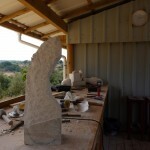 I have to say, I quite like this Stone Carving lark, especially when it is laced with delicious honey! Hi Jamie i love you\’re Blog! The information is great keep it up.